Philadelphia, Pennsylvania, has been home to two NHL clubs: the Quakers who lasted just one season, and the Flyers, who were born in 1967. In between, Philly was home to a handful of minor-pro clubs in various leagues. One of them was the Philadelphia Ramblers of the Eastern Hockey League, a blood-and-guts league that was a couple notches below the NHL. The Ramblers played their home games at the old Philadelphia Arena and were coached by Edgar "Chirp" Brenchley. Brenchley's Ramblers had a so-so season in 1957-58, going 30-31-3. Their 63 points put them in fifth place, just two behind fourth-place Johnstown and 14 behind league-best Charlotte. On offense, the Ramblers potted 223 goals, fourth in the league. They were led by Bill Kurtz (featured on the cover), who had 35 goals and 71 points in 64 games. Three other players, Rheal Savard (24), Nick Rukavina (22) and Ross Turnbull (20) were the other Ramblers with at least 20 goals. Philadelphia allowed the third-fewest goals in 1957-58, just 211. This was the era of teams employing just one goaltender, and the EHL was no different. Ivan Walmsley played in all 63 games that year. No playoffs for the Ramblers that year, as they, along with last-place Clinton, were the lone teams left out in the cold. As for the program, this is one of the older ones I own. It's also one of the smallest hockey programs I own too--just 13 pages, but with plenty of ads. It starts off with an articles about Coach Brenchley and Ray Crew. Each player has their own "thumbnail sketch", aka short bio. Local advertisements include Berry Bros. Buick, Pop Corn Sez. Co., Vincent P.Sully Commercial Printer and Ballantine Beer. 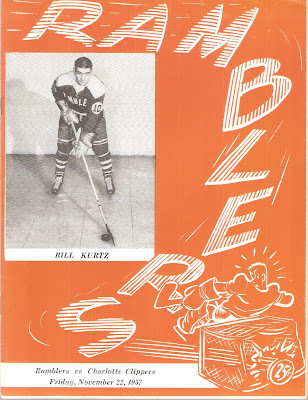 Aftermath: The Ramblers would exist through the 1963-64 season before folding. Philadelphia, of course, would join the NHL as part of the "Class of '67" group. The city would still be home to minor-league hockey since then, including the AHL Firebirds in the 1970s and AHL Phantoms from 1996-2009.